Water makes a great defensive feature, which is why so many castles are surrounded by a moat; but the early inhabitants of Scotland had another way of looking at this idea. Instead of digging a moat around a dwelling, they built a dwelling in a loch – either creating a man-made island or adapting a natural one that was in a convenient position. They built a wooden house on it to protect themselves and their livestock, and connected it to the shore with a narrow causeway. These island dwellings were called ‘crannogs’ and they are dotted around western Scotland and Ireland. There is debate about where the word ‘crannog’ comes from, but the most likely origin is the Old Irish crannóc, meaning a wooden structure or vessel. In Scotland, some crannogs are believed to date back to the Neolithic era (see update, below) but most were built during the Iron Age, making them about 2,600 years old. The excavation of a crannog on Loch Tay has revealed its original structural timbers, together with remnants of food and clothing; archaeologists even discovered a butter dish with traces of butter. Open an OS map of anywhere in Argyll, Perthshire or the Highlands and look at the lochs: it’s highly likely that you’ll find a crannog. Scotland has about 600 recognised crannogs, but there are probably many more awaiting discovery. The vast majority of crannogs were built in inland lochs; well known examples include Loch Ness (Cherry Island); Loch Sguabain and Loch Frisa on the Isle of Mull; and Loch Awe, which has about 20. 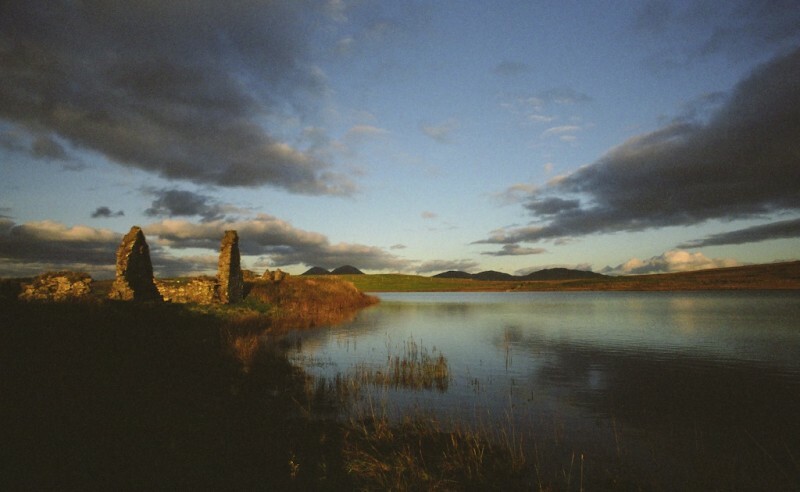 At Finlaggan on Islay is the ancient seat of the Lords of the Isles, a stronghold that was spread over several islands in Loch Finlaggan. One of these, Eilean Mhuireill, is believed to be a crannog. Quite often, crannogs remained in use long after their original construction – in fact, some were occupied until the early 1700s. In Aberdeenshire, it is recorded that the Scottish family Burnett of Leys lived on a crannog in the Loch of Leys (now drained) from the early 1300s until the mid-1500s, when they built Crathes Castle. Loch Tay has many crannogs, as a search of the RCAHMS website will show. The most easily visible is Priory Island, a wooded crannog at the north end near Kenmore; this was joined to the shore by a causeway, which is now submerged. In 1122 the island was granted by Alexander I to the monks of Scone Abbey, and it is here that a priory was built and Alexander’s Queen, Sybilla, was buried. In 1492 the island was given by James IV to Sir Duncan Campbell of Glenorchy who, according to the 17th century ‘Black Book of Taymouth, ‘…biggit the great hall, chapel, and chalmeris [chambers] in the Isle of Lochtay’ before his death in 1513. The ruins are still on the island. On the eastern side of Loch Tay, just south of Kenmore, is the Scottish Crannog Centre, where visitors can step back into the Iron Age inside a reconstructed crannog. So what links crannogs with the other Iron Age structures of Scotland, the massive stone-built brochs such as Dun Carloway on Lewis and Dun Beag on Skye? One source speculates that more brochs occur in the north-west of Scotland because stone was more abundant here than wood. But, to me, that doesn’t seem to answer it completely. Admittedly, brochs did come later than crannogs, most dating from around 100 BC to 100 AD; but I would still like to know if there is any link, or whether the two ideas evolved separately. If you’re an expert in this field, I’d be pleased to know your thoughts. Meanwhile, if you’re exploring the lovely lochs of western Scotland, keep your eye open for crannogs! Update, 14th December 2016: As shown in the BBC series ‘Digging for Britain’, recent underwater exploration of two lochs on the Isle of Lewis – Loch Arnish and Loch Langabhat – has yielded fragments of Neolithic pottery, convincing archaeologists that the crannogs in each loch were built in the Neolithic period, not the Iron Age. This evidence pushes the history of these crannogs back a further 2,000 years, and it is natural to wonder if other crannogs, once believed to be Iron Age, are hiding similar origins. Do the text books need to be re-written? Read more on the University of Reading blog, and the Newsletter of the Prehistoric Society. You’ve got a good selection of crannog photos there. I’ve never yet managed to visit the Crannog Centre, despite trying more than once. My parents have been though and they thought it was excellent. I didn’t know about Priory Island on Loch Tay, what a fascinating history. I’ll have to pay more attention to it next time I’m passing that way. Another great post. 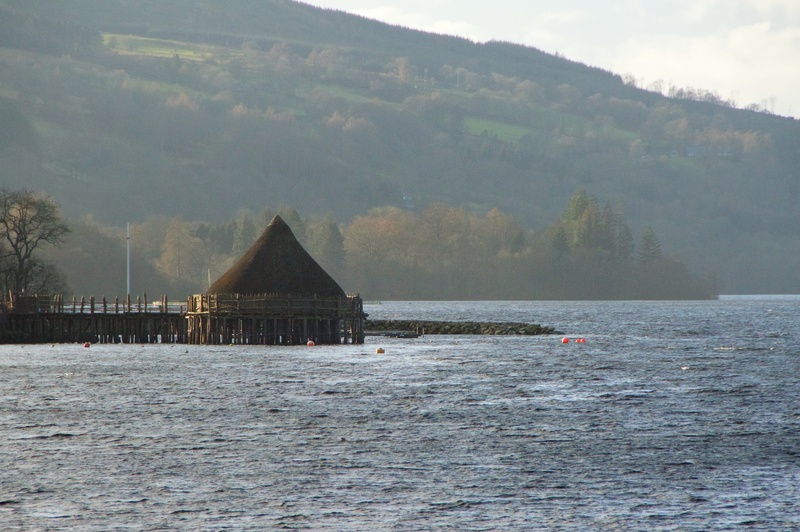 We visited the Crannog Centre at Kenmore, Loch Tay last year & found the history fascinating. Thank you, Ash! I have seen the Crannog Centre on TV and I would love to pay a visit. Crannogs are fascinating, thanks for a great post! Have you ever covered Crathes Castle before? Your mention here reminded me of one of my favourite Scottish castles (favourite gardens, too). Thank you! I had not heard of crannogs in rivers, so I’m delighted to know about those. Thank you for the map! It has also reminded me that Dumbarton Rock is another place I’d love to visit. That’s very interesting! I’ll make a note – thank you! I am guessing that some round houses were built on natural islands, but it seems most were man-made, or at least modified. Yes, Loch Awe has plenty! What fascinating history traced in watery settings- a butter dish with a bit of butter left is a great detail! Yes, isn’t it amazing? It brings ancient people so close. I love finding out about things like that! The Neolithic crannogs recently touted on Digging for Britain are definitely not the first Neolithic crannogs, as the presenters claim on the BBC programme. Neolithic islet sites have been known in the Hebrides since the early 1950s. Eilean Domhnuill, an artificial Neolithic island on North Uist, was excavated in the 1980s by Ian Armit, and another archaeologist Robert Lenfert recently wrote about the origins of Neolithic islet sites quite recently I believe. It would seem this new fieldwork shown on Digging for Britain is based on this author’s PhD fieldwork and research. That’s very interesting to know! Thank you, I will look up Eilean Domhnuill. I wonder why they were presenting the evidence as if it was completely new? They are playing the academic game, lots of funding involved here, so they under pressure for results and public impact, no concern for copying other folks research designs. I’ve spoken to the directors before about Eilean Domhnuill, so they were fully aware of it. The site they found on Lewis was a stone mound with intact timbers around the base, which I believe is a first for a Neolithic crannog, but Eilean Domhnuill is otherwise identical, only lacking the timbers. 20,000 sherds of Neolithic pottery came from Eilean Domhnuill, so it’s not very hard to mistake for something else! There is also another timber crannog in a loch which was drained over a century ago in the Outer Hebrides – locals at the time noted a timber frame within the stone mound, so this indicates there are more Neolithic crannogs – not a surprise if you talk to the handful of researchers who are familiar with this area of archaeology. Tree cover in the Hebrides disappeared sometime in the Neolithic – after that peat formation took over, so any Outer Hebridean sites using large amounts of timber are almost certainly Neolithic or older. Even on Iron Age sites in the Hebrides, the few timbers excavated by archaeologists there were primarily driftwood from a species that only grows in North America – larch – so this demonstrates timbers were in very short supply, even two millennia ago. The made these claims on TV, but when it comes to publishing their fieldwork, they will have to change their story or put a nice spin on it. Ha, pardon, I meant to say it IS hard to mistake Eilean Domhnuill for something newer! I believe that site produced one of the largest, if not the largest, assemblage of Neolithic pottery in the Western Isles. That’s very interesting, especially about the decreasing tree cover. And that’s a lot of pottery! I guess that a lot of these projects rely on public funding, and all publicity is good. I’d like to have seen a reference to the earlier research though. I got quite excited, thinking it was a major breakthrough! Meanwhile I’ve been watching the recent three-part ‘Orkney’ series with interest and trying to keep an open mind. A lot of theories have to start with an assumption, or at least that’s my impression. We tend to draw too many conclusions based on our modern-day thinking. Thank you very much for sharing your insight. This is the kind of information that I find fascinating – proves that we can’t divide history into convenient slices!